Lylah’s Opening Day Party Photos! Today, September 23, we will welcome you to a new and exciting exhibition with Tatiana Alexandra at 4PM SLT. She will get your motor running, I can promise you that! We had fun and enjoyed the atmosphere at our previous party in August, with Lylah Landar! We are especially grateful to our wonderful dj, HaileyMarie Redrose , and Nicasio Ansar, hosting the gallery in his wonderful Mirage sim – this will mark the first party in the sim with the new Fall colors, one more reason to look forward to it. Your participation means a lot to us, and we were delighted to see there so many of you, friends, fellow patron of arts, and well, assorted pervs who I am sure were not disappointed by what was on display! No surprise there…the party started getting naughty preeetty soon! And much more that has not been caught on camera…or maybe we keep in our HD for blackmail purposes! 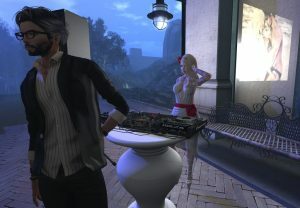 Vicki and I are waiting for you at tonight’s party celebrating Tatiana Alexandra – again, 4 PM SLT, with Hailey as DJ. We welcome and encourage your partecipation at the event : photos taken at the event and your entries in Guestbooks will be included in future projects. Submit your material related to the exhibition on the Gemini Gallery Flickr Group. Tati’s Opening Day Party Photos!